Introducing Overprinting Press: A delicate .PSD working template that makes your overprint design stands out with worn-out ink and rusty rollers; On top of that the press was built as an inky workflow accelerator – which allows you to explore design possibilities effortlessly. 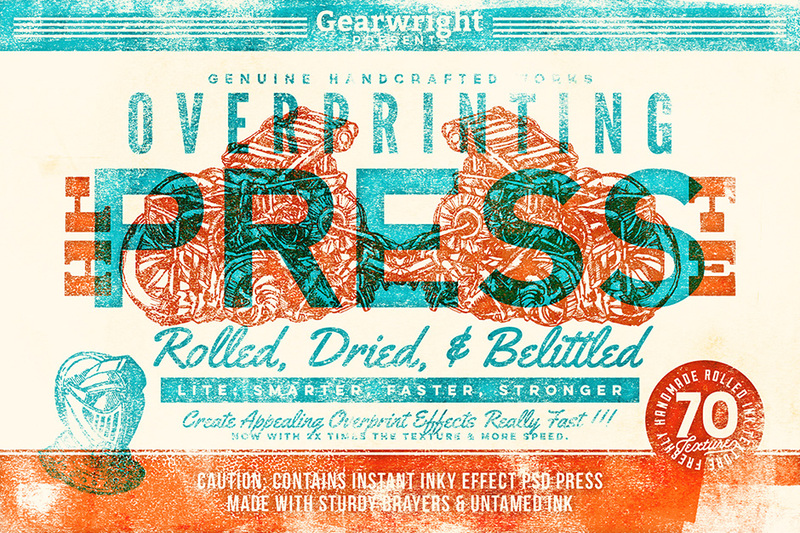 • Overprinting Press Lite .PSD (3000x2000px 300PPI): The .PSD which will transform your artwork into handsome overprinted ink effects as seen in previews in a flash. Drop your design inside Smart Objects and save, the press will do the rest for you instantly. • 70 authentically handmade rolled & dried ink texture (3000x2000px 300PPI) readily set in the press for your creative customization purpose. Like other texture presses of ours, all you need to do is just toggling the visibility of these texture layers and it will be done. • A tastefully crafted template to help you jumpstart Overprinting Press Lite now. Yes, they’re fully editable. • My textures are organic and authentic; they are of high quality, do not tile and never repeat & always freshly made! I never duplicate or adapt texture from/ to another products. You can sit back and relax when you buy from us.